Wrong-way driver incidents make up just 3% of all freeway crashes; however, they are more likely to result in serious or fatal injuries than other types of crashes. When a driver is tired, confused, distracted, or impaired, they may unintentionally turn the wrong way down a travel lane. The most dangerous scenarios usually involve high-speed, divided highways and access ramps. Wrong-way driver events can be terrifying—for both the oncoming traffic and the wrong-way driver involved. “Wrong Way” signage aims to stop them before they become serious by alerting drivers to their error and take action by self-correcting. Yet many incidents still occur. Some cities are finding new ways to enhance wrong-way driver signs to further increase their visibility. They are also adding cameras that alert authorities to an incident in progress; this can help emergency responders arrive on-scene faster to take action. In Reno, Nevada, “Wrong Way” signs already existed on all freeway ramps, placed to alert drivers errantly traveling in the wrong direction. 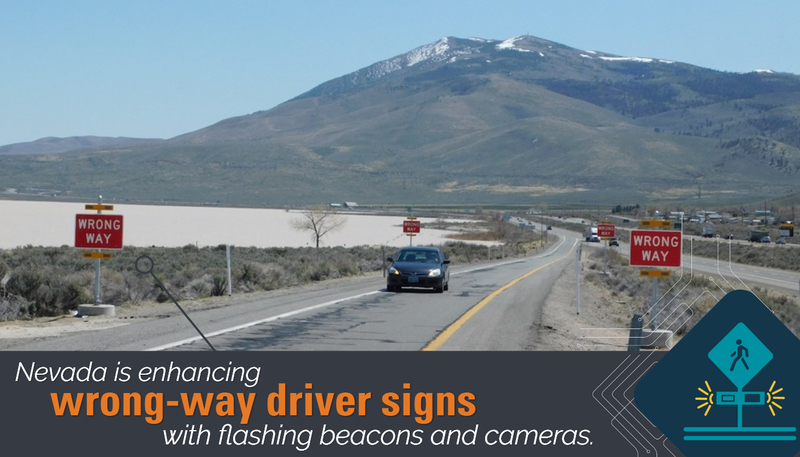 NDOT sought to add additional flashing warning signals and detection systems. According to NDOT, there were 279 wrong-way driver crashes on Nevada’s freeway systems between 2005 and 2015. These crashes resulted in 41 fatalities and 125 injuries, and are often caused by impaired or confused drivers, NDOT reported. In 2017, NDOT received permission from the Federal Highway Administration to experiment with rectangular rapid flashing beacons, previously only used for crosswalks. Typically yellow, the beacons were changed to red and affixed to “Wrong Way” signage at various locations in the North Valleys region. 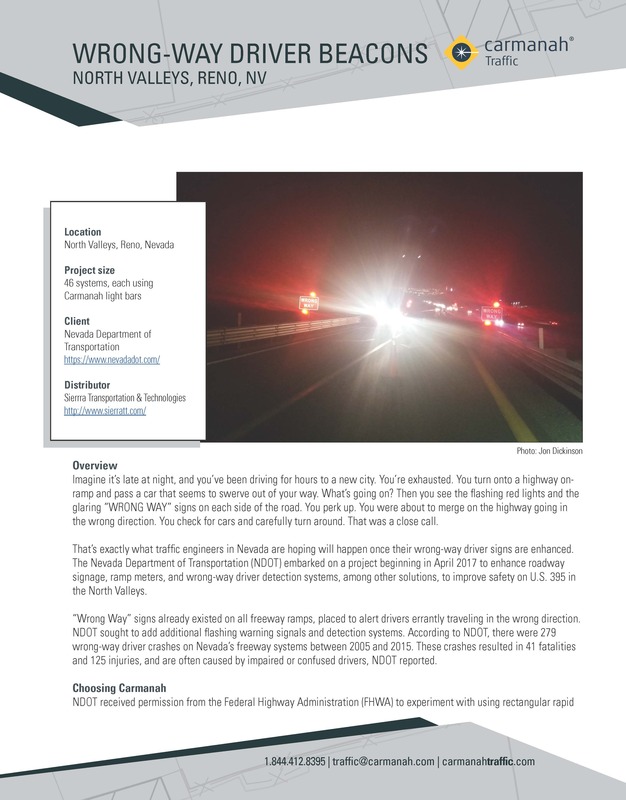 Carmanah provided the light bars for 46 wrong-way driver detection systems. It also provided the “brains” of the systems, which are pole-mounted, electrically powered, and self-contained. “This obviously isn’t the typical installation for these light bars, so there had to be a modified Carmanah controller designed for the wrong-way driver application,” says Aaron Lockwood, Business Development Manager for Carmanah’s Traffic division. Carmanah worked with distributor and project manager Sierra Transportation & Technologies on the project, which is currently being installed on a three-year trial to test the effectiveness of this solution.